Welcome to the online information resource for Nevada Career Institute's Commencement Ceremony. Here you will find a wealth of logistical information, helpful tips, and background material. Complete all classroom requirements and pass senior final. All eligible graduates must complete the online registration form and bring it to your campus before 4:30 pm on Thursday, May 16, 2019 to participate. Click to complete and print out the Graduation Registration Form. Registration fee is $65 and includes Cap, Gown, standard Tassel and 4 tickets. Registration fee for graduates with Perfect Attendance is $35 and includes Cap, Gown, standard Tassel and 4 tickets (sign off by Campus Director required). Should the graduate fail to meet participation guidelines prior to May 29, 2018, registration fees will be applied to the next scheduled graduation ceremony. Acceptable payment methods include: cash, check, money order, and debit/credit card. Late registrants will be accepted based on availability (additional fees may apply). Cap and Gown sizes cannot be guaranteed after registration deadline. Guest tickets are subject to availability. 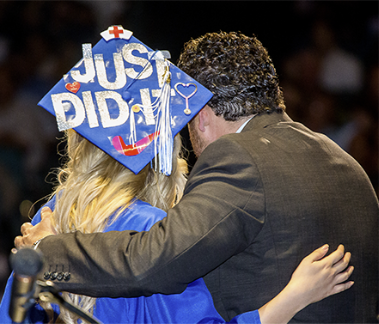 Pick up your cap, gown and tickets on Thursday, May 23 at the NCI Cap & Gown Expo. The Expo will be held from 4pm - 8pm at the campus. Please contact the campus if you have questions or cannot attend the Cap & Gown Expo.